The Free to Play Gamers Movement is live! 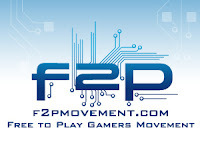 A revolutionary Free to Play Movement is born (f2pmovement.com). Its goal is to turn the Free to Play genre into something to make players proud and help publishers and developers to have more success and high quality titles. The Free to Play model is constantly growing and has proved to be a real success. Western game developers have already begun to recognize the system's benefits and the top Massively Multiplayer Online RPG´s, such as Everquest II, Dungeons and Dragons Online and Lord of the Rings Online have all made the leap towards the free-to-play model. DFC Intelligence Forecasts point to a $2 billion market by 2015 for this model alone. Free to play games are an important part of the present and will outgrow pay-to-play games in the near future. The Free to Play Gamers Movement aims to take the genre and steer it in the right direction. How? By reaching out to millions of gamers with valuable opinions that will change the face of things to come. Nowadays, a large number of games are advertised as free-to-play, getting all the hype but failing to deliver. A lot of them are nothing but glorified demos, asking players for money to continue playing. Aggressive marketing leads to a bad reputation to the free-to-play market, resulting in deluded and disappointed players. This is just one example of what needs to change to guarantee the future of the free to play model. - Bring together all the Free to Play gamers around the world. One player's opinion hardly matters, but a community makes all the difference. - Bring more quality paid games such as World of Warcraft to the Free to Play model. - Confirm that there is a market for developers to invest more in Free to Play games and thus increase their quality standards. - Change the games that define themselves as Free to Play and yet block almost the entire game, acting like a demo version. This is not our definition of Free to Play. - Put a stop to the in-game items that disrupt the entire balance of the game. - Better service and better solutions for hackers, spammers, and bots. - Less grinding and more in the way of actual content. What can you do to join the Movement F2P? Go to http://www.f2pmovement.com, join the mailing list, and Facebook Page at http://www.facebook.com/f2pmovement. Don't hesitate to invite your friends and participate. Help us make F2P Movement go viral and reach millions of gamers.